Model T Ford Forum: Where can I fine info on restoring the top? Any suggestions? Couple questions. Where can I fine info on restoring the top? Any suggestions? Couple questions. 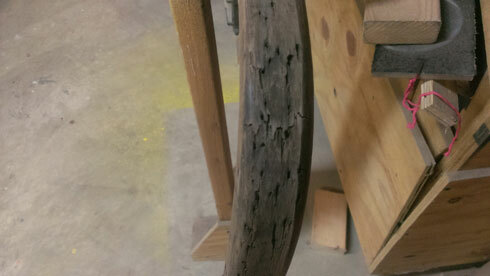 Model T Ford Forum: Forum 2014: Where can I fine info on restoring the top? Any suggestions? Couple questions. 1. I thought it best to plug up the holes. I was going to smooth over either bondo or poly qwick wood filler. Any suggestions? 2. 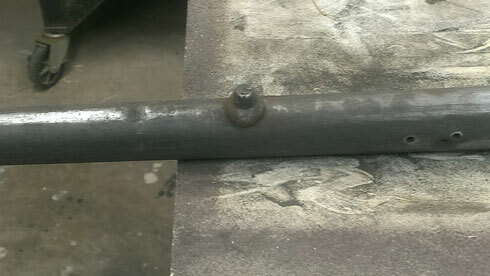 The one picture shows what appears as a riveted carriage bolt type bolt. The other side is missing it. Should I replace with a rivet or just cotter pin a carriage bolt. 3. The one picture shows the pin sticking out next tot he pliers holding the cap I took off. The pin or nail shaft wiggles but seems attached on the inside?? How do I get it out?? 4. 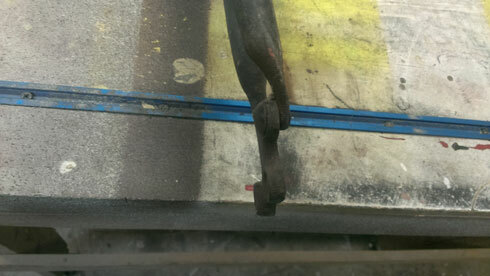 The male protrusions and the female cups that support the male protrusion on the irons are loose. Is it worth just keeping them that way or can they be tightened down. Maybe just leave well enough alone?? 5. is there a reference for restoring the top. I do not even know the proper terms for the parts. I used round tooth picks and glue and put in over a thousand in three older wood bows so i could use them. You let them dry overnight and sand them off next day.So far so good. Snip the tooth picks in half first. They are easier to tap in and makes twice as many. Then dip them in glue and tap them into the holes. After the glue dries, snip them off close to the bow with a wire cutter, before using a belt sander to smooth out the bows. Works great. 1)The holes in the metal are for the Murphy fasteners. I think by 1912 they were the brass cast type (maybe stamped?) with the oval base. 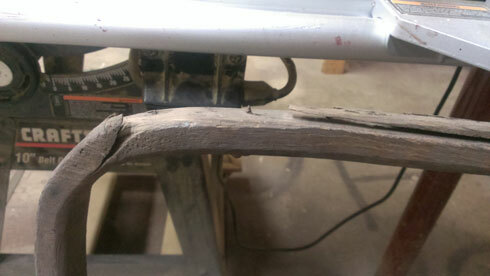 Plug the holes in the wood with toothpicks, or replace the bow wood. 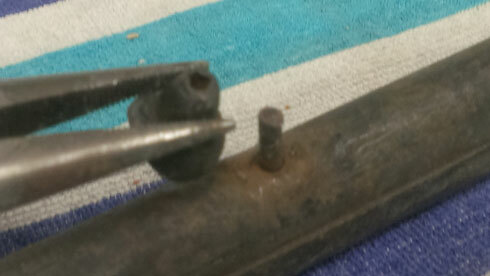 2)I believe the cotter pin and carriage bolt replaced a pin that had a rivet type head with a cotter pin hole. 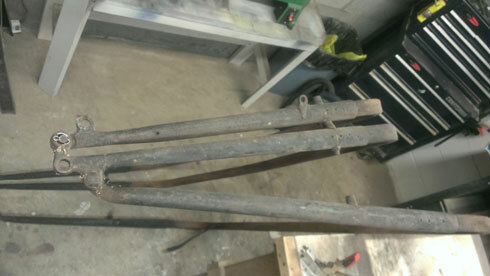 3) The bow separators are riveted on. You could re-attach it with JB Weld, maybe braise it together. The example included is not a T, but it gives the basics for each step in the process. My own advice from a been there/done that is that if you scaffold and tie all of your top irons/bows firmly in place (there is a diagram somewhere here that shows dimensions to jig to) then you can get respectable results. 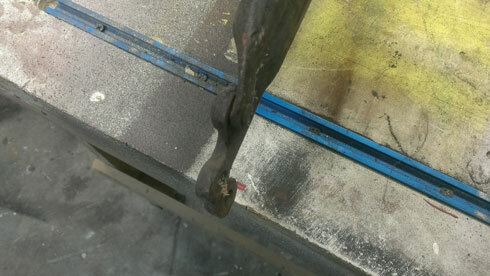 There are a few tricks to it, such as how to dimensional jig the front header bow before top covering...only nailing the back bow tacks half-way and then alternating 'the pull' on the tacks and resetting until all stretching is done and you are happy with the stretch...then send them 'home' to seat.